Who knows and can explain the cruise line hiring process better than anyone else? The people in charge of staffing! This is why CruiseJobFinder has gone out and interviewed so many people in the industry. We want our members to have the real advantage of knowing how to get a job. Plus, our JobCenter has all the latest job listings! What could be cooler than working on a small cruise ship headed for the arctic or antarctic? 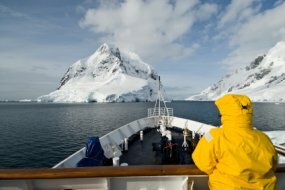 For a truly unique cruise ship working experience consider applying to Antarctic Dream, which takes travelers to the world's polar regions. A company rep told us about their company, awesome job opportunities, and the crew hiring process. Please tell us about your company and role in the staffing process. Our company takes adventure-minded people to the world's Polar Regions. My main role is to receive and process resumes in order to hire new employees. The typical cruise is fun, filled with adventure, provides awesome experiences, but with a lot of work as well. Some crew members experience seasickness during the Drake crossing, but usually the trip is one of the best trips ever for the employees. We need guides, bartenders, deck crew, engineering crew, and room service employees. Do you only hire people from the immediate area or do you occasionally hire people from other areas or even other countries? We hire people from all over the world. It always depends on each season, and we generally see how the season is faring when deciding how many employees to hire and what positions we need to fill. We require employees who are responsible, commitment, proactive, are hard working and honest. We also need to see that you have an interest in learning and always have a good, positive attitude. This is very important. The main benefit is getting to know the destination, as well as sharing a common adventure with your other crew members. This is something people talk about forever and a time in their lives that they always look back on with fond memories. You will get to interview face to face with the Manager and the General Manager, after which you will be contacted by phone if you get the job. Many people think that the job is easy and that they will find it relaxing, not too stressful, and an easy way to make money. This could not be further from the truth. You will be working extremely hard doing physical work most of the time.